Featured Heritage Building of the week - 205 Victoria Avenue - Real Estate Blog - CENTURY 21 Westman Realty Ltd. 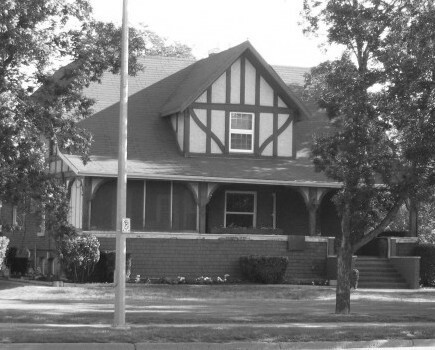 This large Tudor-style home was built for Archibald Forbes Campbell in 1891. Campbell was born in India, where his father was employed as an officer of the East India Company. He attended school in Scotland before immigrating to Canada in 1886. When he arrived in Brandon, Campbell began work as a furniture dealer and established the prominent business Campbell & Campbell, which was located at 29 10th Street. Archibald Campbell resided at 205 Victoria Avenue until his death in 1943. The home’s steeply-pitched gable roof is accented by a decorative gable with exposed Tudor beams. The roof extends into a gently-sloped overhang which shelters a beautiful open verandah. The verandah is adorned with columns and carving detail. Photo and information courtesy of the City of Brandon’s Heritage Brandon website.